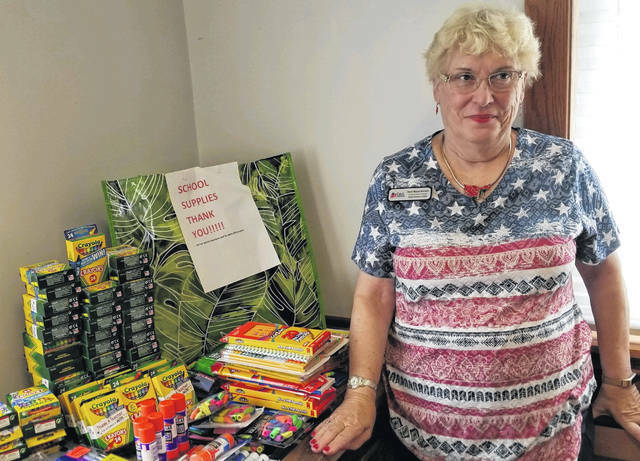 Chapter members’ donations of school supplies pictured with Community Classroom Chair Nancy Bernard. 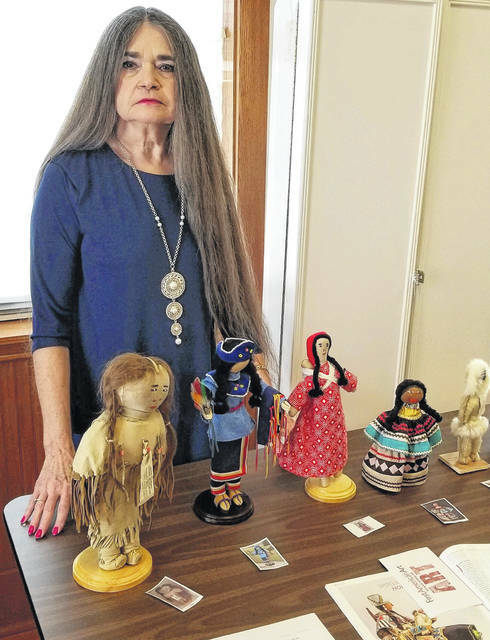 Carol Darnell with some of the dolls described in “Dolls In Native Culture” program. Presented by Carol Darnell, she told how dolls were an important part of Native life, not only toys for children, but part of the people’s religious rituals and wellness. Each tribe had their own dolls, which were used in religious ceremonies, death rituals, fertility rituals and spirit beliefs. Children, both boys and girls, were given dolls to teach them how to care for others and model adults. Girl dolls sometimes came with extra items like sewing kits, and little villages while boy dolls could be accompanied with horses, bow and arrows, sleds and tools. Early dolls were made of clay, tanned hides, grasses, corn and beads. Carol shared with us a portion of her handmade Native doll collection which she had on display. Carol is not only a DAR member, but also involved with the Intertribal Native American Learning Center, Miami Valley Flute Circle and the National Center for Great Lakes Native American Culture. During the business portion of the meeting presided by Frances Sharp, Regent, reports were given by Joyce Peters with the President General’s message, Barbara Daulton read the National Defense report, Pat Wallace gave a Constitution minute, Carol Darnell gave an Indian minute and Linda Hamilton gave a Conservation minute. Nancy Bernard, Community Classroom Chair, reported that 23 students started the year in our Community Classroom. School supplies were collected at this meeting for the students. Plans for the DAR Day of Service project were discussed. Linda Barkey gave an update on the Wreaths Across America project. Regent Sharp announced that Susan Neuhart was appointed to serve on the audit committee. Refreshments were served and thanks extended to hostesses Claire Ropp, Barbara Daulton and Lois Hackney.